Nobody knows exactly where the word pizza comes from. A recent theory identifies it as an Italian corruption of pita, an Arabic word describing the bread popular in the Middle East. Despite a possible medieval etymology, it is true that the term "pizza" became more widely diffused in the sixteenth century around Naples, though there were no actual pizzerias until the nineteenth century. Before that time, Sicilians made a cheese-less pizza called sfincione, which is still prepared today, sold in bakeries and a few restaurants. A similar food was popular in the southern part of mainland Italy. Tomatoes were being cultivated in these regions by 1600, and this crop greatly influenced the cuisine. More popular was foccaccia, a crusty bread flavoured with spices and herbs. Recipes for flavoured bread, in one form or another, had existed since ancient times. There was also bruschetta, slices of toasted bread seasoned with chopped tomatoes, olive oil and other toppings. Pizza, as we know it today, is essentially a Neapolitan invention that evolved from these other specialities. In Naples the most popular recipe was the margherita, named for a queen of Italy, made with tomatoes, mozzarella and fresh basil leaves, thus representing the colours of Italy (red, white and green). The cheese was the element that distinguished urbane "modern" pizza from its rustic forebears. One of the differences between pizza and its culinary cousins is that it almost always is made with tomatoes and some kind of melted cheese, usually mozzarella or something similar. Mozzarella, incidentally, is not considered "cheese" by Italians. It is, strictly speaking, a "milk product." Yogurt, feta and ricotta (cottage cheese) are also in this category of milk products which, unlike true cheeses, are not aged. Among the better mozzarellas for use in pizza - some would say the best - is the buffalo mozzarella of the region around Naples. Buffalo milk is very rich and dense compared to cows' milk, and has a unique flavour. Unfortunately, there have been problems with milk quality due to the bovines grazing on pastures where toxic chemical waste was dumped, and it may be a few years before buffalo mozzarella's reputation restored. But in Sicily the demand for pizza made with buffalo mozzarella has not diminished as a result of this fiasco. In addition to a base of tomato sauce and a layer of mozzarella, toppings (which Italians call "condimenti") abound: hams (prosciutto, speck), salami, sausage, bresaola, guanciale, mushrooms, peppers, onions, eggplant (aubergines), olives, tomato chunks, cheeses (gorgonzola, provolone) and - in Sicily - ricotta and artichokes. Even slices of anchovy or smoked salmon find their way onto pizza. Fresh leaves of basil and arugula are also popular. Pizza is Sicily's most popular take-out and restaurant food, though kebabs also have a growing following. Chicken on a skewer remains popular as take-away, but only a distant second to pizza. 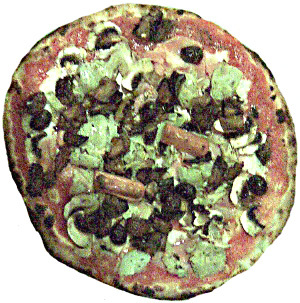 The quintessential Sicilian pizza is the capricciosa (shown here). This usually includes tomato sauce, mozzarella, mushrooms, onions, ham, artichokes, olives and perhaps a few chunks of eggplant. A wurstel is usually placed atop these condimenti. The origin of this strange "Germanic" touch in Sicilian pizza is something of a mystery. Perhaps it is a Sicilian homage to the Italian-born Holy Roman Emperor and King of Sicily, Frederick II.